He was born in Purulia, West Bengal. 1922 His family moved to Calcutta from Purulia. 1929-30 Associated with Abanindranath Tagore. 1940s Visited Gangtok, Darjeeling and Bhutan Border. 1943 Joined the `Calcutta Group`, Calcutta. Basically self-taught. At the age of nine, learned drawing from a local drawing teacher. 1933 Diploma, City College, Calcutta University. 1937-38 Graduated in Law and started legal practice. Visited the studios of Abanindranath Tagore, Jamini Prakash Gangooly, Atul Bose, received lessons and encouragement from them. More than two years he worked in the studio of Hemen Majumdar, where he completed his apprenticeship of portrait painting. 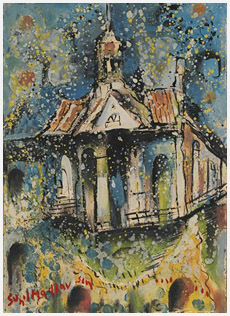 1957 Artistry House, Calcutta. 1961 Hofstra College, New York. 1963 Gallery Everest, Calcutta. Had group exhb. in Tokyo, Brussels, New Castle, New York, Sydney, Perth. Gallery Chemould, Bombay. 1993 Retrospective, Birla Academy of Art and Culture, Calcutta. 2003 Manifestations, organised by Delhi Art Gallery, World Trade Center, Mumbai and Delhi Art Gallery, New Delhi. 2004 Manifestations II, organised by Delhi Art Gallery, Jehangir Art Gallery, Mumbai and Delhi Art Gallery, New Delhi. 2005 Manifestations III, organised by Delhi Art Gallery, Nehru Center, Mumbai and Lalit Kala Akademi, New Delhi. Lalit Kala Academy, New Delhi. National Gallery of Modern Art, New Delhi. Birla Academy of Arts & Culture, Calcutta. Chandigarh Musuem. Library of Congress, USA. New York Public Library. Bradford Museum, England. Administrative Block of the Jadavpur University, Calcutta. Victoria Memorial Hall, Calcutta. Delhi Art Gallery, New Delhi. 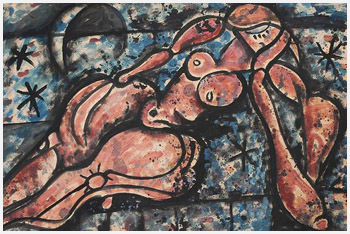 Sunil Madhab Sen in his search for a modernist language in art, has tried out both Western and Indigenous artistic modes to arrive at a personal idiom. A simplified serene beauty, that his art explores, is an outcome of the inwardness of his consciousness. His passage from academic naturalism to Indian folk tradition via European cubistic and expressionistic features and a proper synthesis of all these modes unfolded to him a process of Indian modernity.